He turns the spit who never tasted a morsel from it. Proverbes en Rimes, no. 117. Continuing our salute to cooks this holiday season (Thanksgiving), today’s post includes some depictions of male cooks, as well as female cooks. Nowadays, cooks and chefs get top billing with athletes and politicians. 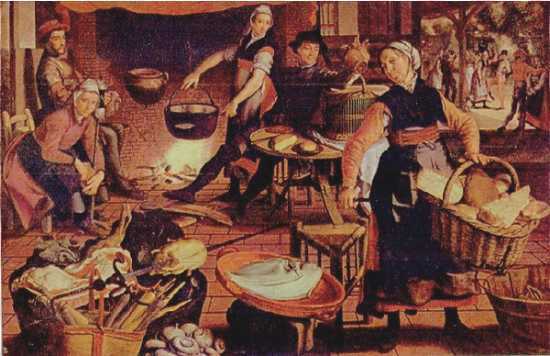 One of the notable aspects of the Flemish paintings lies in the appearance of female cooks being subjected to what we today might call sexual harassment. One of the first realistic portrayals of a kitchen in the Middle Ages, in the Lower Church in Assisi, Italy. This painting can be turned upside down and forms another picture from that angle.